Think 'tavern' and the mind conjures a drinking house with a convivial atmosphere, a boisterous place without pretension, where men and women share food and knock back drinks while exchanging salty tales and have a rollicking good time. 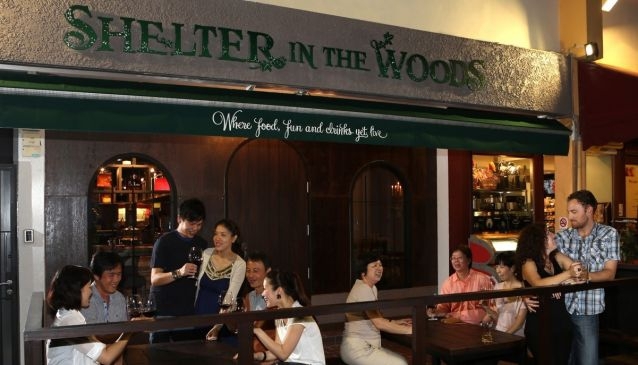 Located on the famed food stretch of Greenwood Avenue in the Bukit Timah area, Shelter in the Woods is more than just a watering hole, but one with a surprising gourmet twist boasting hearty European fare like rotisserie-roasted Suckling Pig, Lamb, and Pigeon. The menu serves the tavern's ethos of casual dining with friends. Its unique and heady mix of ambience, a full menu of unexpectedly good and hearty European cuisine, a treasure trove of spirits, wines and 26 types of house-mascerated rums, make Shelter in the Woods the perfect venue for merrymaking.